The presence of mold in the laundry room shouldn’t come as a huge surprise to anyone. Mold needs moisture to grow, and there’s a great deal of it involved in cleaning clothes. Dirty laundry doesn’t always equal dry laundry; we all remember Mom yelling about wet towels in the hamper. She was concerned about mold growth! It’s easy to forget a load of laundry in the washer overnight (or longer) with extremely busy schedules. Washing machines and dryers are often kept in basements, a prime location for mold growth in homes due to increased humidity levels. Because the basement is the lowest level of a home, it’s the first place to be flooded in a disaster, which means it’s also the first place that will experience mold growth. It’s important to do regular mold inspections around your laundry room to catch problems early, before they have a chance to cause damage. Early detection of mold can save you thousands of dollars in cleanup, replacement, and rebuilding, as well as protect you against eye and lung irritants, so it’s definitely worth the time. ♦ A dehumidifier in the laundry room goes a long way towards mold prevention. Choose a model with a continuous cycle and install a hose so it drains water directly into a floor drain instead of into the collection bucket. This ensures the unit will operate at all times and not sit patiently waiting for someone to dump the bucket. ♦ Check the walls and around pipes in the basement for signs of water damage, such as discoloration and leaks. This should be done at least twice a year; if you have trouble remembering, make an appointment on your calendar or tie it to a recurring event, such as setting clocks forward and back. ♦ Check around the washing machine and dryer for mold growth and clean the appliances regularly. Just because it’s a “washer” doesn’t mean you can skip cleaning it. Follow the directions from the manufacturer’s guide, or check the instructions at the website. Front loading machines need regular maintenance on the doors to ensure moisture, debris, and grime haven’t built up on the auto-lock features or the rubber seals. ♦ Be sure you know how to turn off the water to your washing machine in case of a flood or malfunction. These fixtures aren’t turned off and on very often, so it’s common for them to be stiff or have corrosion. The time to clean and lubricate these fixtures is now, before there’s a crisis and water is gushing everywhere. It’s a good idea to know how to turn off the water to your home from the street too; if you don’t know how, check with a plumber or your water utility company. 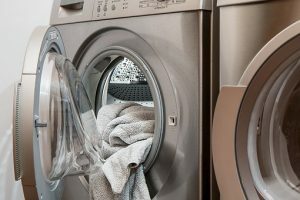 If your clothes have a funky smell even after you wash them, or you find traces of mold inside the machine, you need to do an in-depth inspection of the unit for leaks. ♦ Check the hoses. Pull the washer away from the wall so you can get a good look at the hoses. Check for any drying or cracking and be sure all hoses are securely attached. Over time, connections can loosen, especially if a load becomes unbalanced occasionally and the unit moves around. Run the machine and observe to see if there are any leaks. ♦ Look for leaks inside the washer. Even a tiny leak can lead to big trouble over time if it’s not caught and repaired. Place a small drain pan under the washing machine and check it on a regular basis for traces of water. ♦ Look around the floor. Check around the machine and under the dryer too. Did you think you or the kids spilled something a few times? It might not have been clumsy people, it may have been a leaking washing machine. Mold growth should always be taken seriously. It can cause a great deal of damage to both property and physical health. The spores begin to grow in as little as 48 hours after exposure to moisture, so it’s vital to call ServiceMaster National Capital Restoration at the first sign of growth. We’ve been providing comprehensive mold removal services to residential and commercial clients in Alexandria, VA and Washington, D.C. for over 30 years. We use the Instascope method to test for and identify mold, even in hidden places like walls. Our Trifect mold removal system is a revolutionary new method to eradicate mold in a way that won’t involve demolition or reconstruction on your property. It takes less time, which means less cost for you. Download our free Homeowners’ Guide to Mold for more important information. Mold remediation costs vary, depending on the extent of the infestation. Watch the ServiceMaster video for more information.